The historic blast off of the first SpaceX rocket equipped with ‘landing legs’ and also carrying a private Dragon cargo vessel bound for the Space Station is now slated for March 16 following a short and “successful” hot fire check test of the first stage engines on Saturday, March 8. It’s T Minus 1 week to lift off ! The brief two second ignition of all nine upgraded Merlin 1D engines powering the first stage of SpaceX’s next generation, commercial Falcon 9 rocket at the end of a simulated countdown is a key test required to clear the way for next Sunday’s planned night time lift off at 4:41 a.m. EDT from Space Launch Complex 40 at Cape Canaveral Air Force Station in Florida. “Falcon 9 and Dragon conducted a successful static fire test in advance of next week’s CRS-3 launch to station!” SpaceX announced today. The primary goal of the unmanned SpaceX CRS-3 mission is to deliver over 5000 pounds of science experiments, gear and supplies loaded inside Dragon to the six person crew living and working aboard the International Space Station (ISS) flying in low Earth orbit under NASA’s Commercial Resupply Services (CRS) contract. “In this final major preflight test, Falcon 9’s 9 first-stage engines were ignited for 2 seconds while the vehicle was held down to the pad,” said SpaceX. The static hot firing is a full up assessment of the rocket, engines, propellant loading and countdown procedures leading to a launch. The engines typically fire for a barely a few seconds. SpaceX engineers will evaluate the engine firing to ensure all systems are ready for launch. This commercial Falcon 9 rocket is equipped for the first time with a quartet of landing legs, Elon Musk, the company’s founder and CEO, announced recently as outlined in my story – here. The attachment of landing legs to the first stage of SpaceX’s next-generation Falcon 9 rocket counts as a major step towards the firm’s future goal of building a fully reusable rocket. The eventual goal is to accomplish a successful first stage touchdown by the landing legs on solid ground back at Cape Canaveral, Florida. For this Falcon 9 flight, the rocket will sprout legs for a controlled soft landing in the Atlantic Ocean guided by SpaceX engineers. Extensive work and testing remains to develop and refine the technology before a land landing will be attempted by the company. “F9 will continue to land in the ocean until we prove precision control from hypersonic thru subsonic regimes,” Musk says. SpaceX hopes the incorporation of landing legs will one day lead to cheaper, reusable boosters that can be manufactured at vastly reduced cost. The March 16 launch will be the fourth overall for the next generation Falcon 9 rocket, but the first one capped with a Dragon and heading to the massive orbital lab complex. Three prior launches of the more powerful Falcon 9 lofting commercial telecom satellites in September and December 2013 and January 2014 were all successful and paved the way for SpaceX’s new mission to the ISS. And this Dragon is loaded with the heaviest manifest yet. The research cargo includes 100 protein crystal experiments that will allow scientists to observe the growth of crystals in zero-G. In the absence of gravity, the crystals will hopefully grow to much larger sizes than here on Earth and afford scientists new insights into designing and developing new drugs and pesticides. SpaceX is under contract to NASA to deliver 20,000 kg (44,000 pounds) of cargo to the ISS during a dozen Dragon cargo spacecraft flights over the next few years at a cost of about $1.6 Billion. To date SpaceX has completed two operational cargo resupply missions. The last flight dubbed CRS-2 blasted off a year ago on March 1, 2013 atop the initial version of the Falcon 9 rocket. If the launch takes place as planned on March 16, Dragon will rendezvous and dock at the Earth facing port on the station’s Harmony module, after a two day orbital chase, on March 18. The Harmony port was recently vacated by the Orbital Sciences built Cygnus cargo spacecraft to make way for Dragon. Both the Dragon and Cygnus resupply spacecraft were privately developed with seed money from NASA in a public-private partnership in order to restore the cargo up mass capability the US completely lost following the retirement of NASA’s space shuttle orbiters in 2011. The Dragon docking will take place a few days after Monday’s (March 10) scheduled departure of three crew members aboard a Russian Soyuz capsule. Watch the Soyuz leave live on NASA TV. The departure of Russian cosmonauts Oleg Kotov and Sergey Ryazanskiy along with NASA astronauts Mike Hopkins marks the end of Expedition 38 and the beginning of Expedition 39. It also leaves only a three person crew on board to greet the Dragon. The Soyuz return to Earth comes amidst the ongoing Crimean crisis as tensions continue to flare between Russian, Ukraine and the West. American and station partner astronauts are 100% dependent on Russia’s three seat Soyuz capsule and rocket for rides to the ISS and back. Command of the station was passed today from Oleg Kotov to the Japan Aerospace Exploration Agency astronaut Koichi Wakata. With the start of Expedition 39, Wakata thus becomes the first Japanese astronaut to command the ISS. Wakata and NASA astronaut Rick Mastracchio with use the stations Canadarm 2 to grapple and berth Dragon to its docking port. Dragon is due to stay at station for about three weeks until April 17. Then it will undock and set course for a parachute assisted splash down in the Pacific Ocean off the coast of Baja California. For the return to Earth, Dragon will be packed with more than 3,500 pounds of highly valuable experiment samples accumulated from the crews onboard research as well as assorted equipment and no longer need items. 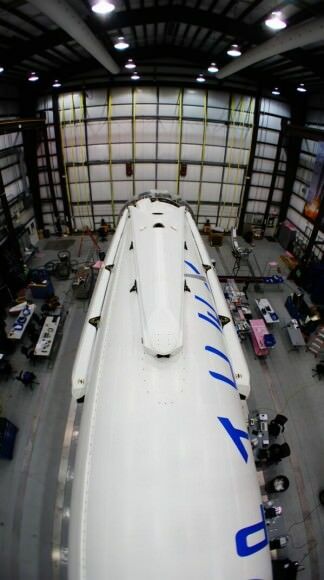 Stay tuned here for Ken’s continuing SpaceX, Orbital Sciences, commercial space, Orion, Chang’e-3, LADEE, Mars rover, MAVEN, MOM and more planetary and human spaceflight news. Learn more at Ken’s upcoming presentations at the NEAF astro/space convention on April 12/13. And watch for Ken’s upcoming SpaceX launch coverage at Cape Canaveral & the Kennedy Space Center press site. The Landing legs … I assume that means more than just adding weight, right? Well landing the rocket decreases the payload to orbit by about 30 to 40% (extra weight and extra fuel). But it can also decrease the cost of a launch considerably. We don’t know exactly what the COGS is on a commercial Falcon 9 v1.1 rocket launch, but we do know is that the fuel costs for that launch are well under 500,000 dollars (aka, peanuts). We also know that the retail price of a launch is 57 million. If we make the not unreasonable assumption that all both stages could be landed and reused 10 times with minimal refurbishment. That would suggest that the retail price of a launch would be somewhere in the neighborhood of 6 or 7 million. Even if you assume that a landed stage could only be used twice in total before being hucked in the scrap heap that would still be ~30 million instead of ~60 million. That’s one heck of a savings. Given that the Falcon 9 is already one of the cheapest rockets on the market, any further reduction in price – whether it’s 1/2 or 1/10th – would be icing on the cake. I’ll also mention that given the steep price of building rockets, the old analogy about the cost of a rocket vs the cost of a plane applies here. Basically, using a disposable rocket to get into orbit is like flying from New York to London and then throwing away the 747 when you get there, and building a new one for the return trip. Disposable airliners would make intercontinental air travel as unaffordable as space travel is today. Conversely, reusable rockets would lower the price of a trip to orbit to no more than the price of a first class ticket from NY to London. Where will it splash down? Will they fish it out of the water? Might something be reused or is corrosion the end of it? @Zoutsteen You may be inclined to think so considering they are aiming for a soft water landing but in fact they are quite critical. During the last launch they also attempted a soft water landing but it failed, the reason was the rocket started to spin violently and the small stability thrusters could not compensate. The landing legs will function as fins on the rocket adding stability most critically on decent. SpaceX has recovered past stages, all were far too damaged for reuse but a recovered stage is incredibly valuable for validating design and looking for weakness. Static tests are good and jolly but nothing beats actual recovered hardware after a real flight. GO Space-X! GO Falcon 9! I can hardly wait to see videos of a Falcon 9 first stage booster returning to the launch pad… THAT will be a sight for sore eyes!